This top has been 9 to 10 months in the making. I actually started on this at the end of last summer, intending for this to be a wearable muslin. My intentions, at that time, was to use this pattern to make a mock wrap dress. As you all know I hate doing FBA (full bust adjustment), which is why I was so excited about this pattern because it comes in cup sizes. I was close to finishing the top when I discovered the fit from the bust to the waistline was terrible. It was extremely loose in the armhole area and had too much ease in the waistline. In response, I, of course, was pissed and tossed it on the shelf with my fabric stash and didn’t look at it for months. I came across it in December and decided to add additional darts to see if I could remove the gapping the armholes. But I tossed it back on the shelf because I knew I would not be wearing it anytime soon and wanted to focus on other projects. I finally took it off the self two weeks ago to finish it. After I added darts for the armhole, I inserted the invisible zipper, finished the hem, and here we are. This is a wearable muslin, so I went with View A because it was the most basic designs out of all the views. I used quilting cotton that has been in my stash since 2016, and I purchased it from Hancock. Based on the pattern instructions I did the B Cup pattern piece even though I wear a C-cup in bras. I cut the size 8. The upper bodice is lined. When I finished the top it fit very loose in the armhole area. I added another dart in the bust area to fix that. All in all, for a wearable muslin it is a good fit. The right shoulder strap is loose but that is my fault because the left shoulder strap fits great. One thing I didn’t like is that the back of my bra straps show when wearing this top, so I had to wear a strapless bra. I also am not a fan of the little pick-a-boo scene I have going on in the bodice area. Not really sure how to fix that but I will worry about it another day. I finished the hem by doing a four thread over-lock stitch on my serger. I then turned the serged edge under, stitching about ¼ inch from the hem, as I was sewing to finish the hem. 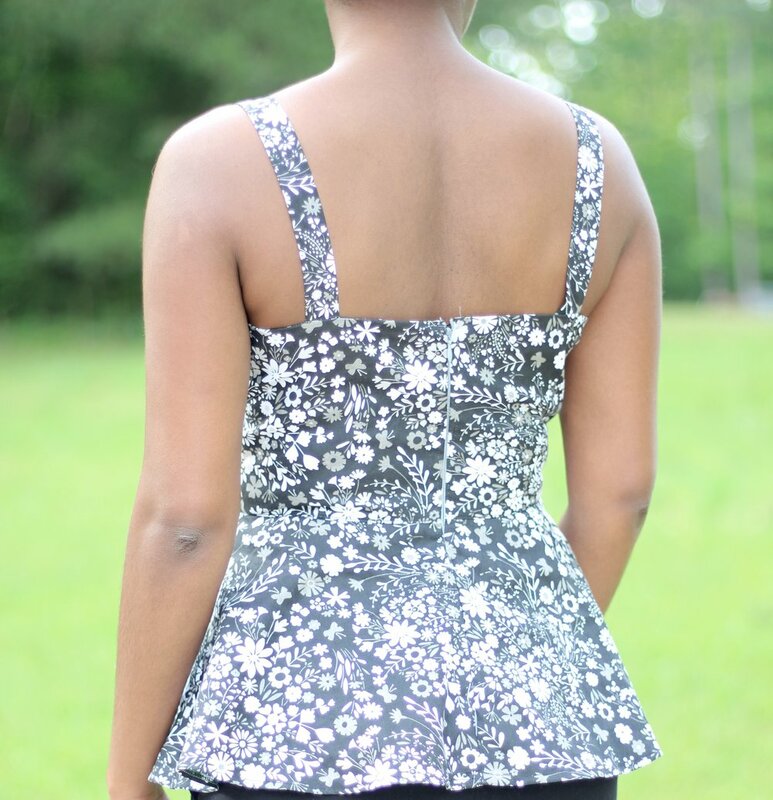 I really like this top and this fabric design because it can be dressed up or down. I am sure it would look good with jeans and sandals, so expect to see this top on my Instagram account a few times this summer.